One of the most common dental treatments is a tooth filling, because this treatment can be used to repair a cavity and strengthen a weakened tooth. When a cavity needs to be removed, it is important to fill in the space in order to keep the tooth strong, which is why a dental filling will likely be suggested. Here at Simply Teeth, we offer everything from basic dental fillings to bigger dental treatments as well. Dr. Dhaval Patel and our entire staff are focused on the satisfaction of each patient, and we will work hard to help you identify the right dental treatments for your individual needs. When is a Dental Filling Necessary? When you are talking with our team, there are several situations that might merit the recommendation of a tooth filling. Most people know that these fillings are used when a person has a cavity, but dental fillings can also be beneficial for other dental problems as well. Anytime a portion of the tooth needs to be repaired, then a filling can be used. For example, if an accident happens and a portion of the tooth is chipped or cracked, then a dental filling might be used to strengthen the tooth. The dental filling cost is worth the expense, because you will be able to protect the tooth and prevent bigger problems in the future. If you are having any problems with your dental health, then it is important that you schedule an appointment with a dental professional right away. It might be tempting to delay the appointment, but procrastinating a filling might cause more pain and problems. When the tooth is decayed, the decay will continue to spread and get worse unless it is treated by a dentist. If a tooth is cracked, then the damage might continue to spread without a dental filling. Basic dental fillings are much easier and more affordable than waiting until a bigger treatment is needed, such as a root canal or dental crown. 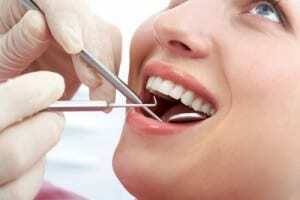 There might be situations where a small problem is identified during your regular dental checkup. These 6-month exams are the perfect time to ensure that you are maintaining good dental health, making it easy for the dental team to identify small problems in the early stages. Here at Simply Teeth, we are dedicated to your dental health. If you have questions about dental treatments, feel free to call our office any time. We invite you to contact us today to schedule a checkup.